From building a stand to hold a touch screen monitor, mounting lighting brackets to structural steel for rough in, or a complete mezzanine over 10,000 square feet. They are all one of a kind fabrication. If you could buy the piece you need you wouldn’t be drawing it on a napkin. That’s where we come in. Fast efficient and very good at reducing your idea to a build ready drawing, then fabricate what you need. Structural Engineer stamping is available, design and consultation. Our experience in the food industry helps keep you in standards, AIB, BRC and others. Our craftsmen and estimators are trained with AIB food safety standards in mind. We have 40 years experience in food plants, we work and install clean and safe. We also have 30 years experience in solvent extraction plants. We understand hazardous environments, and how to build for bolt up installation in hazardous environments. 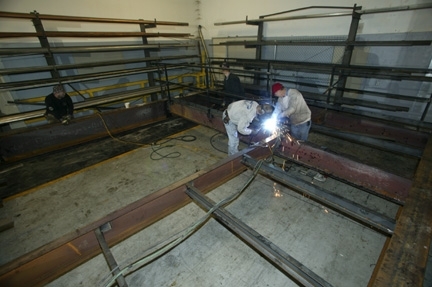 All of our craftsmen are OSHA 10 hour, and foremen are OSHA 30.